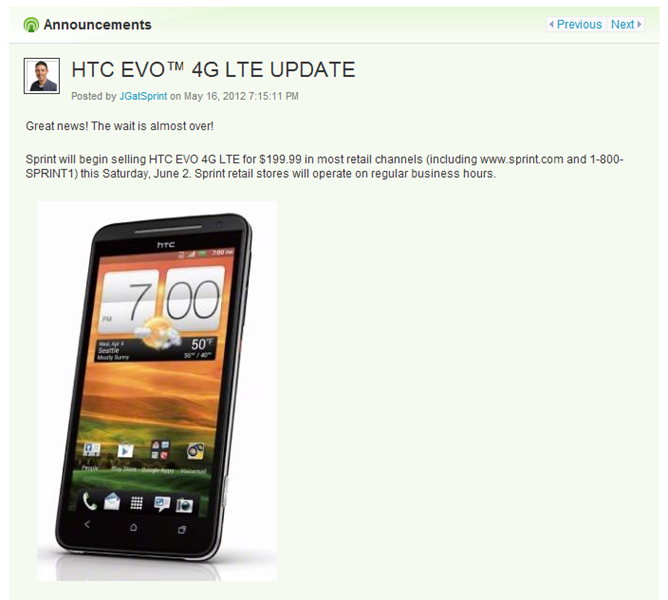 It's been a long, hard, winding road to get here, but finally Sprint has announced via its forums that the Evo 4G LTE will finally arrive in Sprint stores Saturday, June 2nd. The phone will still retail for $199. Amusingly, the new launch date coincides almost perfectly with the original launch date of the Evo 4G, June 4th, 2010. Those of you who picked up the original Evo and are committed to the line will be able to celebrate your 2-year anniversary and contract expiration in style. As we've covered before, if you pre-ordered, your units should already be on its way to you, if you haven't received them already. The rest of you can get up bright and early Saturday morning to head in to your local Sprint store to check them out. No word yet on when other retail locations will be receiving units, but we imagine it won't be much longer now.